A win is a win, but last night’s game unnecessarily went down to the wire after the Knicks blew an early 15-point 4th quarter lead and had to rely on Melo free throws (and the ever-present bad Josh Smith jumpshot) to pull out a 89-85 victory at MSG. 2 BAD, 2 GOOD: Why did this game turn out to be so difficult? It’s hard to cruise to a win when your play right down the middle between horrible and great. The Knicks put together a very good first and third quarter, where they outscored Detroit 24-21 and 32-17, respectively. The second and fourth quarters saw them shooting under 35% and get outscored 20-17 and 27-16. A THIRD THAT SHOULD HAVE ENDED MATTERS: After settling for a 41 tie at halftime, the Knicks blew open the game behind three consecutive treys from Carmelo Anthony to push the lead to 58-49. The rest of the team fed off that energy and became terrors in the passing lanes and on double teams to force seven turnovers (the majority of them on Josh Smith) that lead to repeated fast breaks, including a Shumpert three-point play on Greg Monroe. It turned out to be a 25-3 run that gave NY a 73-58 lead going into the fourth. That should have been the last we saw of the starters. JR SMITH THE CATALYST: Knick fans have come to expect trouble when we see JR starting the fourth. He made several bad passes that lead to turnovers, and the Pistons began to creep back by getting to the foul line. JR had a few iso plays that went nowhere as well. Instead of getting benched, JR continued to get crucial fourth quarter minutes that did the team no favors. In his 30 minutes, JR contributed 6 points (2/6 shooting) and 2 assists. He also got some boos when introduced and very audible groans when he touched the ball in crunch time. FELTON NEARLY BLOWS HIS SOLID RETURN: For most of the game, Raymond Felton played well in his return (12 points, 6 assists). He moved the ball and his jumper was working off pick n’ rolls. The big problems happened late in the fourth when he coughed off the ball on back to back possessions. They were the result of bad concentration — Jennings picked his pocket close to halfcourt, and Felton got stripped driving right into heavy traffic. On top of that, he missed a second free throw that would have iced the game. 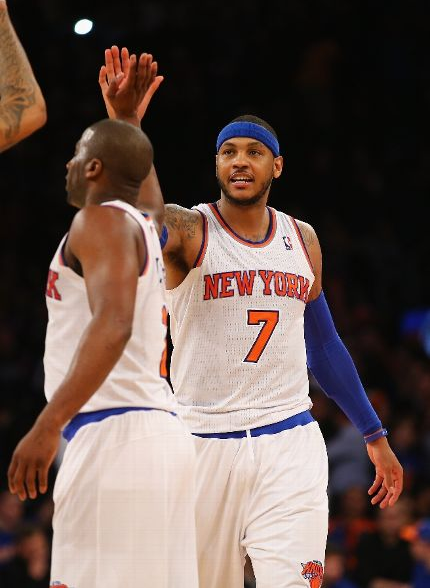 Thankfully, Melo got a key offensive rebound to save the day. MELO VS. J-SMOOVE: Melo (34 points) and Josh Smith (21 points) were battling all night, with Melo getting the better of it most of the evening. However, Smith made a strong push late in the fourth to get the Pistons back in it and got a key offensive foul on Melo with less than 30 seconds remaining and 86-85. Smith then blundered with this airball jumper. The funniest thing about this clip was Melo feeling mighty proud like he blocked the shot. OTHER CONTRIBUTORS: Despite the game being uneven from a playing standpoint, the Knicks were able to gut this out due to varied team contributions. Andrea Bargnani cooled after a fast shooting start, but had a double double (13 points, 11 rebounds). Stoudemire got abused a lot by Detroit’s formidable frontcourt, but still managed to drop 9 points and 5 rebounds in 24 minutes. Shumpert only scored 5 points, but also had 6 rebounds and 5 assists in addition to being the main defensive spark in the third quarter run. The Knicks got the win, but they’ll need to regain their Texas trip form if they have any hope of being the Miami Heat Thursday night.